The Danby freezer is great when you need extra freezer storage, but you haven t got much room, the compact DUF408WE can help. With 4. 2 cu. Ft. (120 litres) of storage space, this energy efficient upright model is ideal for cottages, trailers, apartments or even the office. 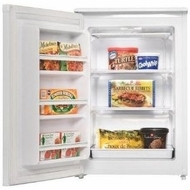 Features a convenient reversible door hinge and 2 quick freeze shelves. 4. 2 cu. Ft (120 litre) capacity upright freezer, Energy Star rated, 2 quick freeze shelves and 3 door shelves, Manual defrost, Easy-to-program mechanical thermostat, Scratch resistant worktop is perfect for storing extra accessories, Reversible door hinge for left or right hand opening, Features a fresh white finish with integrated door handle. The freezer dimensions are 23 10/16 W x 25 8/16 D x 36 2/16 H.